The 3-Day European Conference Athens Shoulder Course was successfully held on January 26 to 28, 2017. 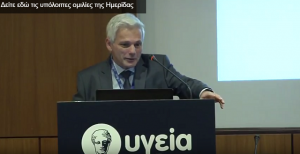 The Conference was jointly hosted by the HYGEIA Hospital 3rd Orthopedic Clinic and the Athens University Medical School Department of Anatomy and Surgical Anatomy. The venue for the theoretical part of the event was the N. Louros Conference Center, located at MITERA Hospital. This was attended by distinguished Greek and foreign speakers as well as trainees from Greece and abroad. All the modern approaches in shoulder arthroscopy and open surgery were discussed. Attendees also watched live broadcasts of surgeries, screened to the auditorium. On the last day, the attendees participated in practice sessions, where they had the chance to watch but also perform innovative minimally invasive techniques on cadaveral specimens. The practice sessions were held at the Athens University Medical School Anatomy Lab.